A common piece of outfit and a key one at the same time, jeans are highly appreciated all around the world. Today we are talking about a trendy model during the latest years: ripped boyfriend jeans. To dress comfortable, do not exclude the idea to be trendy. You can accomplish this very easy if you include into your outfit a pair of ripped boyfriend jeans. They are not only comfortable but also easy to include into your daily outfit. Indeed, they prove to be versatile in any situation. Obviously, it depends a lot on your ability to find the best combos. 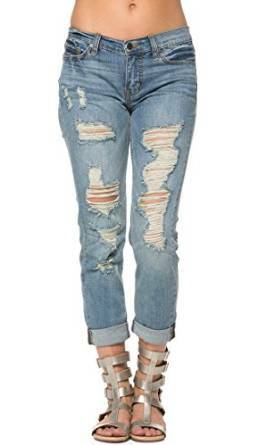 With the exception of the days when you dress formally (if you have an office job for example) you can consider creating an outfit based on a pair of ripped boyfriend jeans. They are as I have already said before, extremely comfortable but you have to be bold and build creative outfits as much as possible. Do not hesitate to create non-standard outfits like the combo with a boho blouse or a simple white T-shirt. In both ways, you will get a very chic look. As for the footwear, basically, ideal for a relaxed outfit would be a pair of casual shoes or sneakers, but that’s not mandatory. 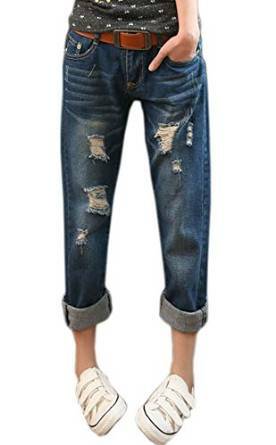 Ripped boyfriend jeans can be worn when going out with your friends and you can match them with a pair of platform wedges or a pair of high heel shoes. Anyway, be careful at your accessories because it would be best not to exaggerate.